Scrummy Savoury muffins were my first thought when I saw this picture, but as it was vegan and for once I was not cooking for me I adapted it for the carnivores in my family. Cook the diced onion with the margarine, thyme and a pinch of salt in a pan over medium high heat until caramelized. To get good color stir often and cook for at least 15 minutes. Set aside to cool in a medium bowl. Mix together the milk and vinegar and set aside while the onions cool. -Spray another skillet with oil and add the pepitas (pumpkin seeds). Carefully toast the pepitas over medium heat until a few begin to make popping sounds and color a light golden brown. Remove and toss with a pinch of salt. In a large bowl, stir together the two flours, baking powder, baking soda and 1/4 teaspoon of salt.Add the soy milk mixture, the pumpkin, the oil and the golden syrup to the caramelized onions. Stir until combined. Dump the wet ingredients on top of the dry ingredients and mix just until combined. Spray a muffin pan with oil and spoon the batter in, filling each compartment 2/3 of the way full. Sprinkle the toasted pepitas on top. Bake for 18-20 minutes, until a toothpick inserted in the center comes out clean. Cool for 5 minutes and then remove from the muffin pan and cool the rest of the way on a baking rack. I've never tried muffins with onions, but they look good! And yay, a recipe to use the whole wheat flour I recently bought! I love pumpkin, so glad I found this blog. :D Any new posts, perhaps? 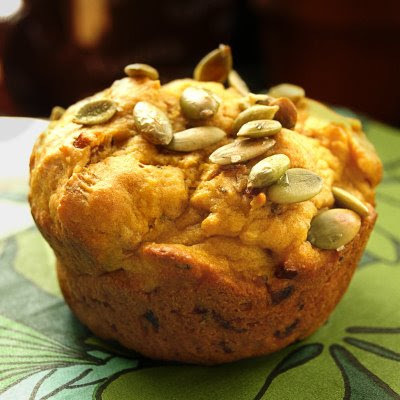 came here for the first time through FB and am happy that i found this blog...i love pumpkin in any form...and i found all your recipes so good....have seen many of them..